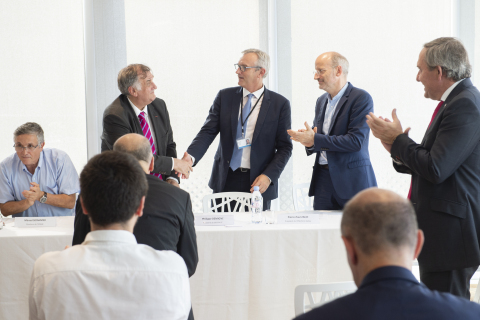 Bertin IT, along with ENSIIE engineering school, today joined forces with Atos, CEA and Ecole Normale Supérieure Paris-Saclay with the signing of an agreement cementing their integration in the ”Industrial Data Analytics & Machine Learning” Chair project. This chair has been created with the aim of developing professions and technologies in industrial data analysis by offering a top-level training cycle, bringing together teachers, students and industrial firms and supporting research and development work conducted in the area of data processing/analysis solutions with startups and SMEs. Intelligent machines will be carrying out 45% of industrial tasks by 2025. Artificial Intelligence (or Augmented Intelligence) in industry consists of algorithm-based systems that give machines the capabilities of perception, learning, reasoning and, even, independent decision-making. By 2020, more than 16 zettabytes of data originating from machines will be available. Analyzing this wealth of data for the Industrial Revolution 4.0 is now possible thanks to recent advances in computing power and connectivity. ATOS, Bertin IT and CEA will supply researchers and students at ENSIIE and ENS Paris-Saclay with actual data (or use cases) obtained from various types of sources (sensor measurements, text, image, multilingual audio data collected by web crawlers...). These bodies of data will be input into the AI model learning process, in the fields of energy, defense and security. Provided use cases will consist of: the early detection of bank fraud for Atos, the detection of high-risk profiles and criminal behavior in the field of cyber intelligence for Bertin IT, or the misuse of massively parallel computers for CEA. This initiative is in line with the European Commission which announced on 25 April that it was allocating €1.5 bn to fund AI research through to 2020. Work for the “Industrial Data Analytics & Machine Learning” chair will be carried out in tandem with the project conducted by the Franco-German institute of artificial intelligence.